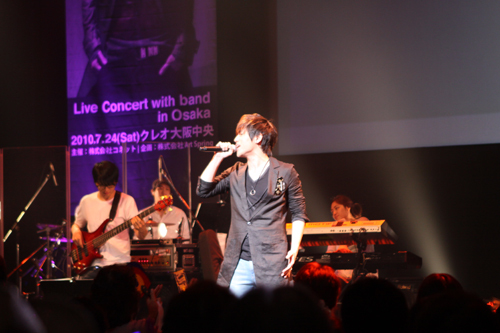 Emotional vocalist, K.Will hosted the solo concert in Japan “K.Will Live concert with band in Osaka” with very successful. From the last concert in Tokyo in May, on July 24, a thousand fans gathered at the concert hall “Creo Osaka Atrium” to attend K.Will’s first visit to Osaka. K.Will opened the evening with “1 Drop per second”. He gained more popularity in Japan from the “Shining Inheritance OST” then he sang the song from this drama “Love is Punishment” and go on with “A Love To Kill OST – Dream”, “The Great Sejong OST – Wish”. Ending the concert with “Miss, Miss and Miss” and the crowed called for encore, “Music is my life” and “Dropping the tears” were brought up and ended two hours performance. There are some misunderstanding about K.Will’s debut in Japan. I’ve checked this information with K.Will’s fancafe members. They told me that he has never debuted before year 2009. To clarify this, he performed 5 times in Japan. 1st, “Korean Music Festival 2009” in Sapporo, September 12-13, 2009. 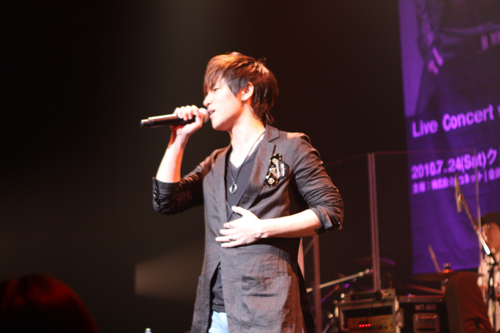 2nd, “K.Will First live & talk in Kobe”, November 29, 2009. 3rd, “Asia Pop Festival” in Nigata, the invitation from NHK, February 14, 2010. Thanks for the info. K.Will always the best.